Weekend di mane dapur sy berasap! Hehe..
Don't you just hate waiting for something you're not sure you'll get? Wanted to do somethings to keep my mind of other certain things so I checked my fridge to see whats available. Kebetulan jugak, on Friday, I went outta my usual 'route' through the pasar malam and for the first time in my life went to the wet market part of the pasar malam. Okay la, admittedly, I don't cook that much and on weekends where I choose to go to the market instead of taking my morning stroll are like the only times I'd cook. I just wanted to look around but the sight of squiggly squid in their black in and smelly prawns tempted me. Okay, somethings wrong with the picture here, camne raw seafood leh tempt me ni?!?! Klu yg dah sedia masak tu cam logic la jugak kan? Hahah..
Anyways.. the next morning I found myself slaving in the kitchen menyiang the sotong and udang (ye, udang sy selalu bogel klau sy yg masak!). I'd bought a can of carbonara (A'ah.. carbonara or any other creamy pasta sauce sy mmg tatau buat from scratch but any tomato-ey kinda sauce, I'd gladly waste my time for that hehe..) a few MONTHS ago so I decided to dump all the seafood (the sotongs, udang bogels, cut-up dory fillet and some crabsticks) in the sauce to eat with some fetucinni.. yummy! Niat nak hantar ke jiran terbantut coz I didn't realize how hungry I was.. boley? I marinated the fillets (along with a few leftover prawns form the day before) in some garlic and paprika. Then a few minutes before iftar, dumped them in a bowl of flour and dipped those in some beaten egg before I covered them with crushed cornflakes (lebihan from my choc with cornflakes experiment). 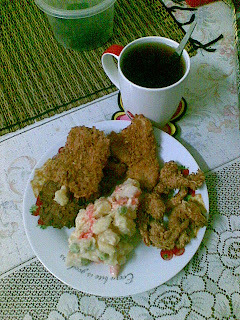 Then of course la musti mau goreng dan hasilnye..
Hmm.. not bad! Got a crunchy coat from the cornflakes but leftover minyak dia mmg tak leh pakai balik dah la heheh..
Tp besa la nafsu org berpuase hehe *redfaced* Actually telah termasak sgt la lebey kan.. sampai malam la sy kene makan abiskan, padan muke! Actually suprised myself that I'd cook 2 days in a row.. boley? Haa.. another one I wanted to share dah lame. I tried another recipe for non-baked cheesecake I got from Maya. 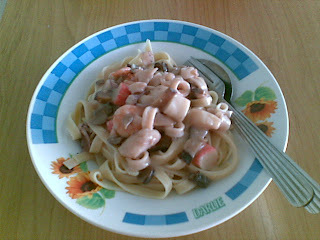 Sedap la jugakk, a bit more creamier that the current recipe I've been using. The topping plak, now I'm a bit of a 'perak', trying out all the available toppings at the shop I usually buy my supplies. 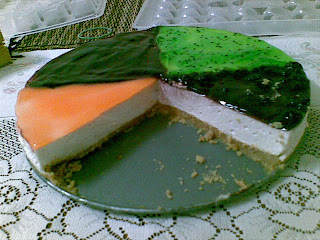 So here's the un-artistic (my student actually told me nasib baik cikgu bkn arts teacher.. cisss.. hahah..) outcome for my cheesecake with orange, blueberry, kiwi and blueberries with fruit topping. Antara sumer I think I prefer the kiwi and normal blueberry (fruitless) topping kot (though more than half dpt kat jiran coz tak larat la sy nak abiskan satu cake tuuuuu..
Last week, my room got flooded! There was something wrong with the roof or something but during a storm on Monday, I found myself swimming in my room.. Okay, I'm exagerrating, but you get what I'm saying right. The water ran down from the front wall of my bedroom and practically flow across the house right out the back door *sigh* I had to spend the best of the morning mopping up the water but gave up after a while since the flow vs Ayu's mopping was showing signs of the flow winning by means of being so much faster than the speed of my mopping. It was only on Sunday did I manage to clear up my room that was already having that queer smell of wet cardboard. Why wet cardboard? Well, when I first rented here, I thought I was ONLY staying for the duration of my masters so I had kept all my moving boxes in preparation for a move. I didn't expect to still stay here 5 years later. nyway, I kept all those boxes neatly under my bed but after the leaking roof disaster, all those boxes were beyong saving so I had to throw them away.. or risk having a room that smells unpleasant enough to make me rather sleep on the couch. Some of those boxes were empty but some had a few things in them that I had totally forgotten about.. 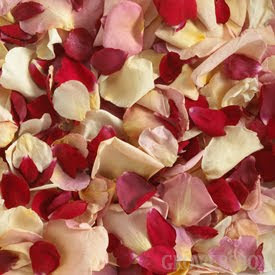 The first thing I found in the first box I was throwing away were a few jars I had filled with dried petals. It made me smile for a long time since these were the flowers I had received during my graduation for my bachelors degree. I had received at least 12 bouquets of flowers (a first for me ok!) and treasured them all enough to not wanna throw them away after they had withered. Instead, I bought these jars and filled them with the dried petals..
Actually, one of these jars also contains the rose petals from the flowers given to me my IM. Somehow, instead of making me sad, it actually made me smile as I remembered my feelings at that exact time. Nope, I don't want him back la (just coz I was smiling.. duh! ), but I guess some memories just stick around in your head anyway! Then I found some A4-sized papers neatly folded. I opened them and almost laughed when I realized they were song lyrics I had compiled once upon a time ago. Almost immediately I began singing some of those songs. There were a mixture of all sorts but certainly songs I had really liked once upon a time ago. After putting those papers into the recyclable pile, I found another pile of papers in another box and was suprised to see that they were Additional Mathematics notes I had made for my students when I had taught the subject a few years ago. The thing is, I've been avoiding teaching the subject for years now.. and I can't remember why! I've almost forgotten that I once taught that and everytime my students want to ask me a question on that, instead of Modern Mathematics, I always tell them I don't teach that subject when I had actually taught it for 3 years kot klau tak silap hehe.. In another box, I found a few more smaller boxes and I opened them to find old gift given to me by.. by.. errr, by sape eh? Hahaha.. aiyak! I've totally forgotten by whom. There's an essential oil burner, a stationary stand, another burner and a few other knick knacks given to me through all the years..
Next I found an old Dragon Ball comic book, salvaged from my school days (my recent one were all recently bought since my original ones sumer telah dihilangkan oleh adik² ku yg tersayang). It was without its dust jacket and all, but it made me go back to my school years when me, Misa and Amoi (and Nafisah sometimes) would go hunt for those comic books. The last box made me laugh out loud when I found my first pair of spectacles. I had bought them during matriculation after complaining of headaches and had my doctor tell me to go check my eyes. I didn't believe her when she said my eyesight was the source of my headaches since had the BEST eyesight in my classes for years! Seriously, I could see farther than anyone else (proven ok.. bkn sy ckp je ni!) 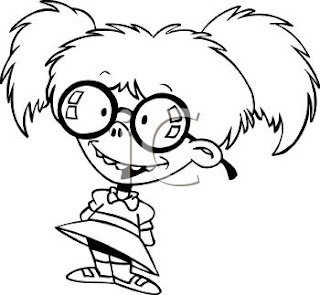 so imagine my suprise when it was revealed that I had to wear glasses. Granted the lense power was only around 50~75 but it sure made me realize why it was so hard for me to focus on the writings on the whiteboard once I started to wear them. But what made me a bit sad was what I had found at the bottom of that last box. 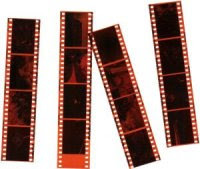 A few old photo negatives during the time digital cameras were still not that affordable and not that easy-to-get like now. Those were negatives of pictures from my convocation, from my data collection days during MSc and alos from the baktisiswa I had joined then, PEWARIS where I had met my juniors whom I'm still close too till now. Luckily I still have the original photos so I just need to digitalyze them but still, there are some mising photos from my collection..
Well, I had fun clearing up my room that day. All sorts of memories jumped right up at me and most of them made me smile and reminisce those good ol' days..
*sigh* Don't you miss all those times you just can't get back, too? Labels: Ayu Emo.. bukan Elmo, Of growing up.. 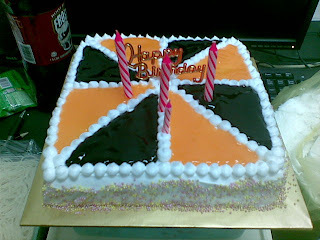 Okay, this is the cake which lead to my tries on trying to cover big cakes with cream. 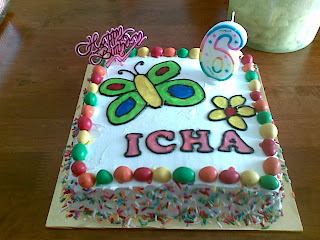 I'd promised my youngest sister who turned 2 last month that I'd make he a cake so voila! Before that, I tried my hand at a few cakes. 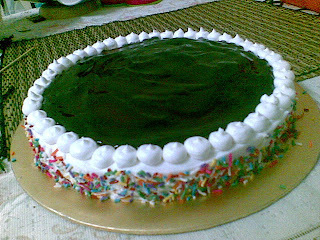 My aim was to make a smooth coating so I had to do it a few times la kan.. with kinda boring toppings sbb pas penat mengcover cake, sy malas nak pk dia nye hiasan.. boley? 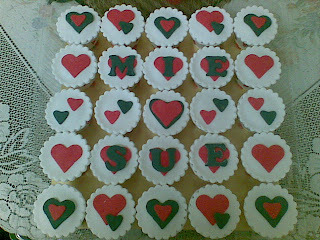 My 2nd try for Duwe..
For kak Sue's cousin. She wanted a black and red theme like the I ♥ New York girl's hantaran the other day..
For my student's sister who got engaged on the 1st of May..
And for my cousin's wedding.. 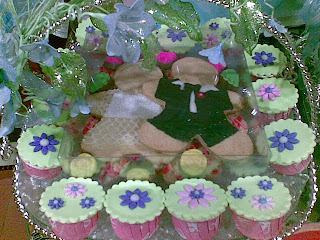 Which she tuko to look like this (along with the cookies and chocolates I also made for her) hehe.. Okay.. I couldn't sleep well last night. Kept thinking and thinking and getting kinda sick at it so here I am, trying to do another 'colourful' entry to chase the blues away.. 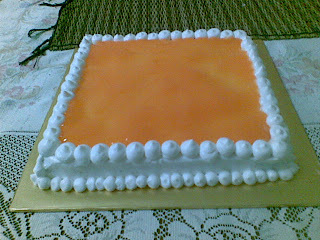 It started when I was struggling with my chocoloate-making (non-existant) skills. I kept getting all non-too-pleased with the result that I think Diana dah tak larat nak layan (haha..!) 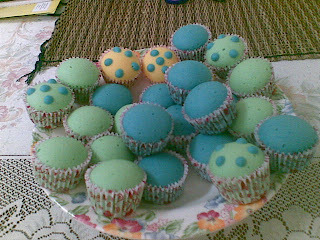 so she suggested I try something she was enjoying doing at the moment: Apam polkadot a.k.a Telur Dinosaur! I can't say that I haven't noticed those colourful kuih on her profile but I was still trying my best at the chocolate thingey that it didn't register in my mind that I could do this. However, due to being locked up in the house coz malas nak keluar, I decided to try my hand at it. Now Diana, bless her soul, had given the recipe along with a few tips she learnt and me being me, didn't ask her any questions and just copied the recipe. 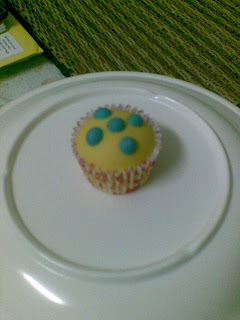 My for my first try, I was quite impressed on how easy and less messy it was compared to cupcakes. 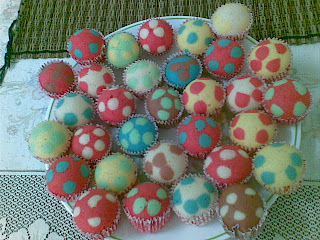 I was having fun colouring the batter and all that UNTIL came the time for the polkadots. I was debating with myself whether to put the dot before of after steaming (halfway la) and was a bit embarassed to kacau Diana and ask her so I decided to steam it halfway THEN only put the dots. Halfway through, baru la kan terkedek nak buh the dots but after a few apams, I somehow felt there was something wrong somewhere so I didn't continue dotting the other apams..
..and this is the result! 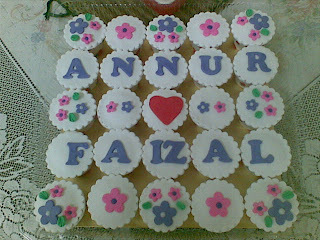 See the other apams which I didn't dot, jauh lagi lawa dari Apam Bisul sy haha.. 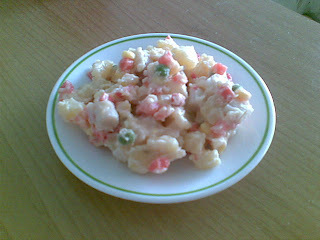 So the next steamed batch (stil same mixture sbb dpt bnyk kannn!) I learnt my lesson and did the dots BEFORE steaming and voila! 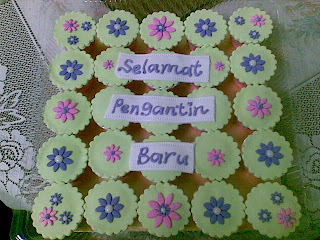 This batch I gave to my students (Ok, nape tetibe rase sedih di sini??!) 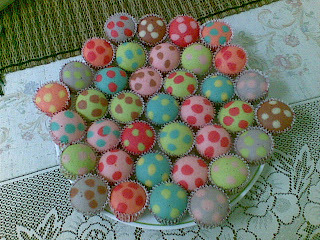 but the next day I made another batch, nak test skill kah? Hahaha..